Every once in a while I splurge and buy a bouquet of flowers from Trader Joes. I snip the edges, throw them into a plain vase and consider that a victory in the flower department. My arranging skills leave much to be desired. Not so with my mother-in-law. Amma, as I lovingly call her, has a way with flowers. It’s as if they speak to her and tell her where to arrange them so as to create a beautiful bouquet. You can hand her a pile of random, clashing flowers and sticks, yet she can somehow, in a matter of moments, turn them into the envy of any housewife. I watch Amma during our visits to Texas. Her eyes naturally gravitate to flora. She notices every blade, bush and begonia. Withour her saying a word, I can see her mind rushing ahead of her into arrangements that perfectly suit each one. Amma comes from India, a world of strong spices, rich colors and saris that are equal parts modest and revealing. She is as stunning as her culture. We have a beautiful framed picture in our home of Amma and Appa on the day of their wedding. Amma tells me that she looks nervous and frightful in this photograph because she was, indeed, both of those things. 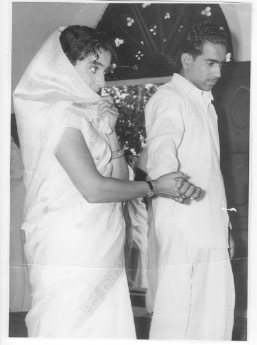 This picture captures her wedding day which also happened to be her second time meeting the man with whom she would spend the rest of her life. When I asked Amma how she felt about being arranged, her calm acceptance amazed me. She explained that arrangement, when done well, happens within a very unique and loving environment and presupposes parents’ deep knowledge of their children. A beautiful arrangement, be it musical, floral or marital, must be preceded by an artful arranger. These arrangers must be keen observers and intimate knowers of their subject matter. As I look out upon a world and a future that can so often seem chaotic and random, I find myself deeply comforted by the presense and power of an artful arranger. Just as Amma knows her flowers, our God knows His children and His creation. Just as Amma’s hands are naturally adept at twisting and bending and ordering strands and pieces and petals, our God is completely capable as He arranges and directs the strands of history and humanity. His transendence and His cosmic knowledge pair perfectly with His immanence and His intimate knowledge. At the end of a bumbling yet beautiful life, King David finds great comfort and confidence in the able hands of this perfect arranger God whom he knew intimately. “He has made an everlasting covenant with me, ordered in all things and secured” (2 Samuel 23:5). Our artful God arranged the painful display of His perfectly beautiful Son on the Cross. In this awful arrangement, He assures us that our brokenness need no longer obscure our beauty. He knows His children the way Amma knows her flowers. His scarred hands arrange the lives of His children, poising them and positioning them for our great joy and His great glory. He doesn’t simply throw us in some water the way I do my poor little purchased flowers. He tends and nourishes, draws out and tones down, prunes and pushes His flowers to their fullest potential. I find great hope, great peace, great comfort knowing that my life, my children’s little lives, the lives of the Nepalese people are being arranged by the Artistic and Able One. I loved reading that Aimee, just beautiful and so well written. Thank you for the precious reminder and the blessing.